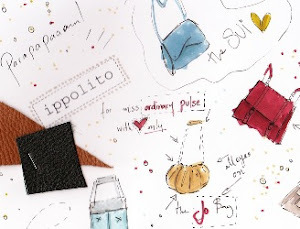 The ippolito designer, Pavlina Papailiopoulou, after the great newcoming success with her leather bags, she is launching leather shoes, belts and necklaces, as well! I saw her new WINTER collection and i'm thrillllllled. I bloody want every single piece on me. Oh and did i say she designed the JO BAG???? Pavlina gave my name to one of her new bag designs, can you believe this? i'm trying... i love you my agapoudi!! (-you'll see me wearing it in preview soon)..
wow! wow! absofckinlutely yeah! they're all amazing! ioannoudi to post einai zuuuper! Pavlina... Do you have the "golden touch"?? These are the most beautiful accessories.. Well done! Ioanna, don't you want a Prigkipo piece to complete the "Joanaddicted Collection"?? -haha i should finally do a proper joanaddicted collection on my own , don't you think?? Haha! You cat burglar! I love the last pic of you! !